You are currently browsing the tag archive for the ‘illustrated books for children’ tag. …that looked as old as Mrs Vaughn. A tiara that looked just like the one the Two-Fold Witch wore (I’m sure the rubies were fake, but they sure seemed real to me. Of course I’ve never seen a real ruby in my life). And best of all, hand-painted figurines of Queen Ija, Professor Headstrong, Mary Annette, Mister Gloom, Master Wix, and a whole mess of other characters. And they weren’t like the plastic junk you see in the toy stores. They weren’t even like those ridiculously expensive “collectibles” they sell to super-nerd adults who never got a life. This stuff – I wish I could explain it – it was like they weren’t based on the characters, they WERE the characters. Like each of those little figures had…I dunno…a soul or something. I remember the first time I heard about Abadazad. It was featured on the sadly defunct Ninth Art review site. J.M. DeMatteis and Mike Ploog‘s series received rave reviews, even talk of a Disney film adaptation shortly after the first issue, but that was not enough to protect the book from the implosion of publisher Crossgen. Fortunately Disney did acquire the rights to the series, but only three books out of a proposed eight were ever published. Here’s an interview with DeMatteis explaining what inspired the story in the first place. 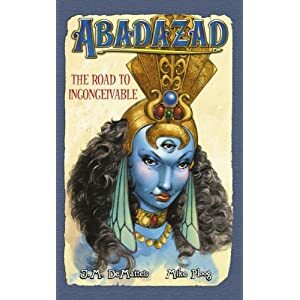 What I am reviewing is in fact the second iteration of Abadazad, published by Disney in a format that mixes Ploog’s art with pages of text. DeMatteis introduces the clever premise that we are actually reading the diary of the main character, Kate, which has been enchanted. So the images that appear are in fact magical windows into the world of Abadazad itself, which Kate can look through – but sometimes the creatures she sees can see her as well. It’s an inventive wave of justifying the use of these colourful illustrations and text. For most of her life, fourteen-year-old Kate raised her younger brother Matty. Her parents separated when the children were young and instead of having a typical childhood in Brooklyn, the two would read the novels of Franklin O. Davies together, describing the adventures of plucky young heroine Little Martha in a magical land called Abadazad. Their mother Frances was left a mess after the divorce, so retreating into this fantasy world afforded the children a welcome escape from the adult world of depression and misery they were trapped in. Kate meets an elderly neighbour, Mrs Vaughn, who owns an impressive collection of Abadazad memorabilia and even claims to have known Franklin O. Davies. At first Kate finds herself reminded of her own dead grandmother, but then Mrs Vaughn starts to say some strange things. Such as that Abadazad is real. She has been there and, what’s more, she was Little Martha. Kate argues that Little Martha was a white girl and Mrs Vaughn is an old black lady. She claims Franklin O. Davies made the character Little Martha white to sell more books, but the books are just adapted from her own magical adventures. Kate is halfway out the door when Mrs Vaughn says something even crazier. Her brother Matty is alive – and he is in Abadazad. For the purposes of this review I read the first two volumes of the Abadazad series. While some might feel the pace somewhat slow, DeMatteis does a great job of introducing the character of Kate and establishing this more modern setting, contrasting her upbringing with that of say Dorothy Gale, or Little Nemo. Abadazad itself is a hybrid of Dr. Seuss and Oz – and Mike Ploog’s illustrations reminded me of the Seussian wonderland featured in Tom Fowler‘s Mysterius the Unfathomable. By the second volume the story really takes off. There are repeated allusions to the censoring of children’s fantasy, with Kate surprised at what Davies left out for commercial purposes. Warm, funny and sweet – travel to Abadazad.